New York is seriously crazy for ube. The purple root vegetable, otherwise known as purple yam, first gained popularity in the city when Williamsburg's Manila Social Club debuted its much-hyped ube donuts last year, and now, Danny Bowien (Mission Chinese/Mission Cantina) and Sam Mason (OddFellows Ice Cream) have teamed up to create another insanely delicious ube-themed dessert. 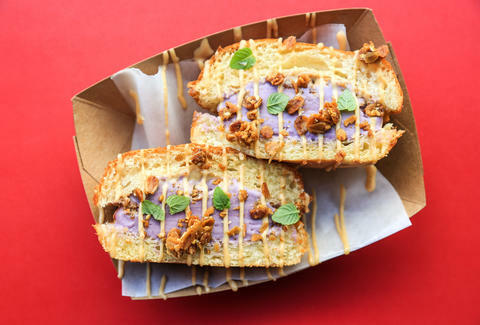 The Ube OddPocket (which just seems like an unfairly insulting name) takes ube ice cream, shiso granola crunch, and coconut dulce de leche sauce and sandwiches it between two beautifully hot and toasted brioche buns -- OddFellows' go-to for its elevated ice cream sandwiches. The sandwich is available now until they run out at OddFellows' East Village shop, so get it while you can! Lucy Meilus is Thrillist's New York editor her future memoir is titled Between Two Buns. Follow her on Twitter and Instagram.